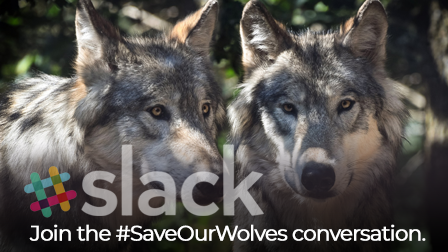 Talk to other activists working to protect wolves in the Call of the Wild campaign by joining our #wolf_campaign Slack Channel. Slack is a free chat tool that works on both smartphones and computers. If you've never tried it before, don't worry. It's super easy and intuitive to use. Why Join us on Slack? Chat with other wolf activists across the country. Receive instant updates and action alerts in the campaign to #SaveOurWolves. Fill out this simple signup form, and we'll send you the link to get started with Slack and join the discussion. Sign up and get your invite to join us on Slack.